CSOdessa team is happy to provide cost effective Organizational Chart Software for companies of any size. It is a ConceptDraw DIAGRAM extended with Organizational Charts Solution from the Management Area. 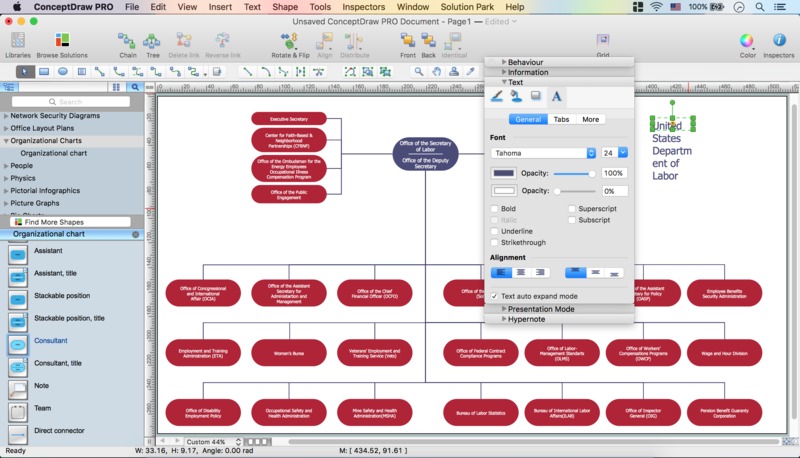 ConceptDraw DIAGRAM organizational chart professional software allows quickly create organizational chart, flow charts, time lines, visualize company Organizational chart, hospital Organizational chart, hotel Organizational chart, corporate organizational chart, and much more. 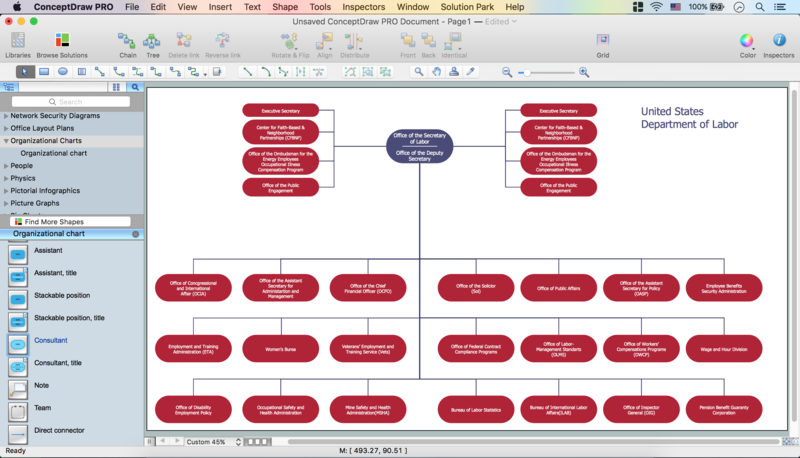 Use it for drawing organizational chart for any size company and analyzing organizational structure. Open the Organizational Charts library from the Libraries panel. Take the Consultant (title) object from the library. Place it on the page. 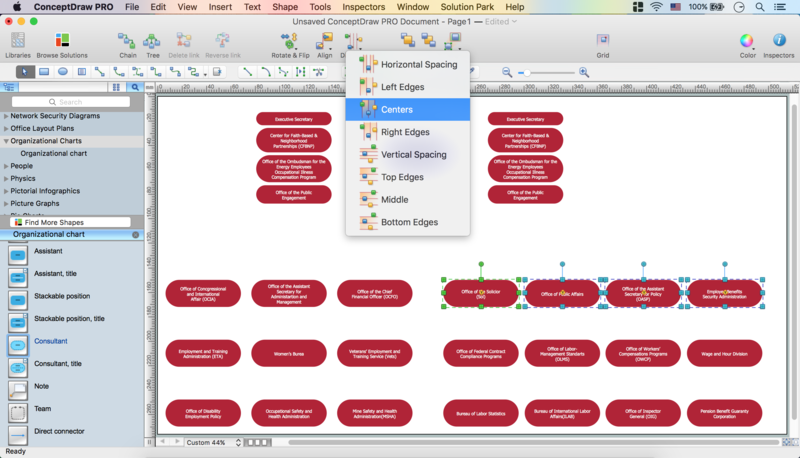 Open Inspectors – Line tab – Set Pattern, Change color. 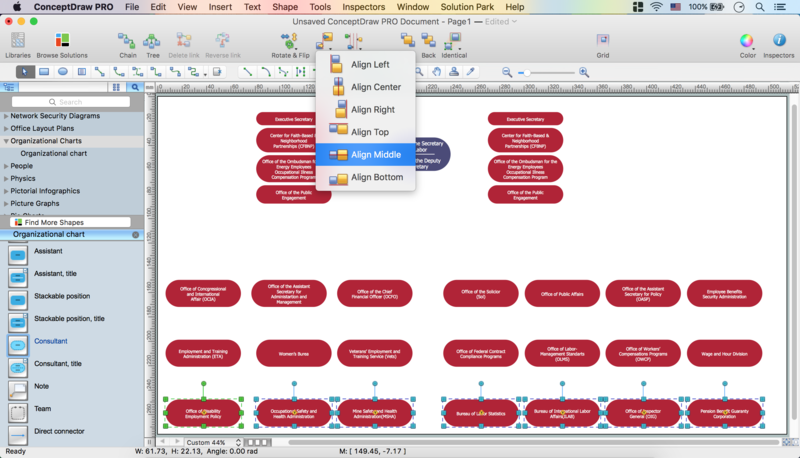 Inspectors – Fill Tab – Change color, set Opacity. 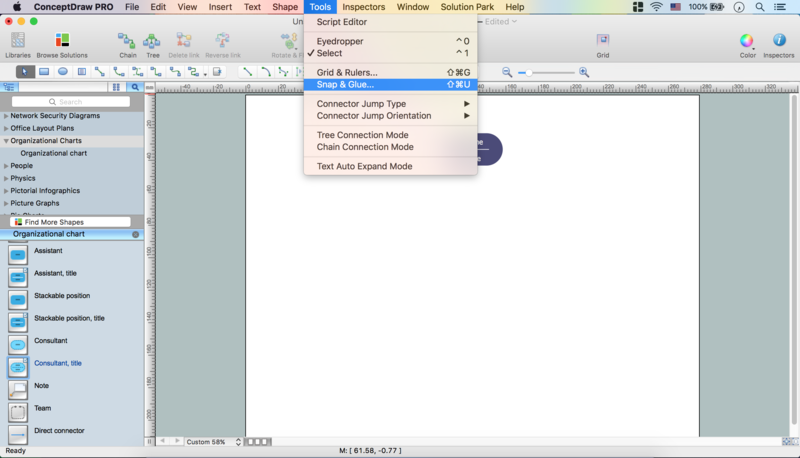 Add the text – Open the Text tab from Inspectors – Change color, font, font size. From the View Menu switch Rulers, Guides. Open the Tools Menu – Snap & Glue – Select Glue to Guides. 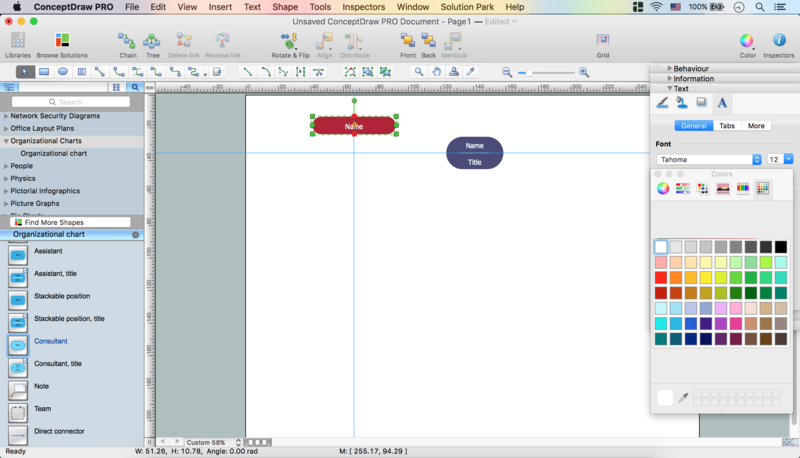 Drag Horizontal Guide from the Ruler to the page. Glue the object to the Guide. 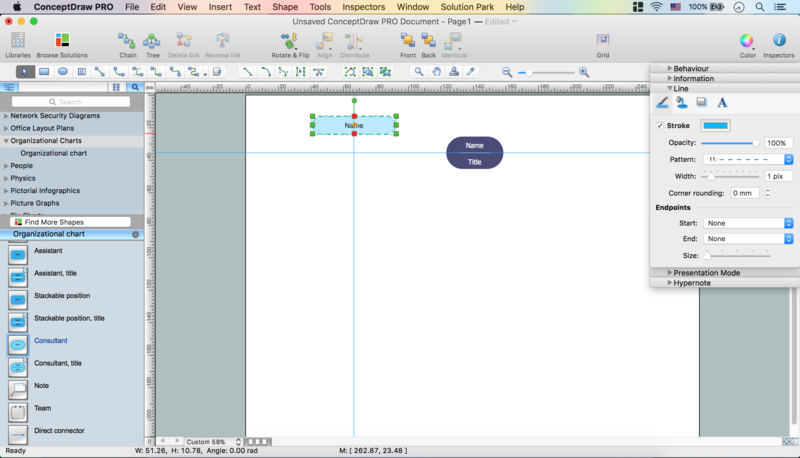 Drag Vertical Guide from the Ruler to the page. 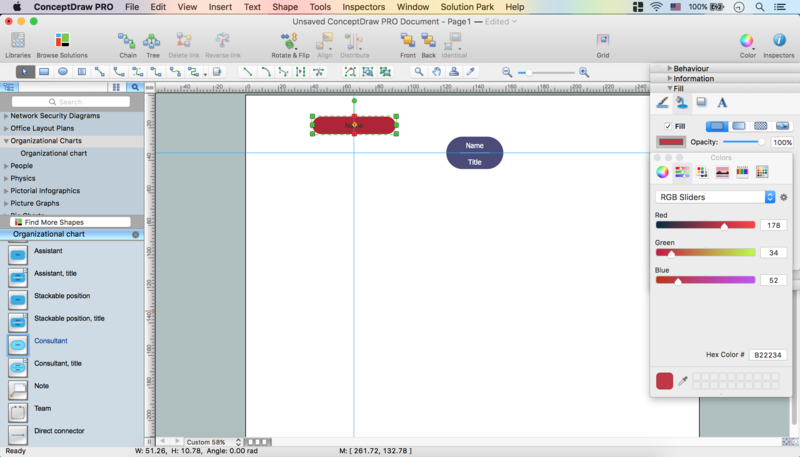 Take the Consultant object from the library – Glue it to Vertical Guide. 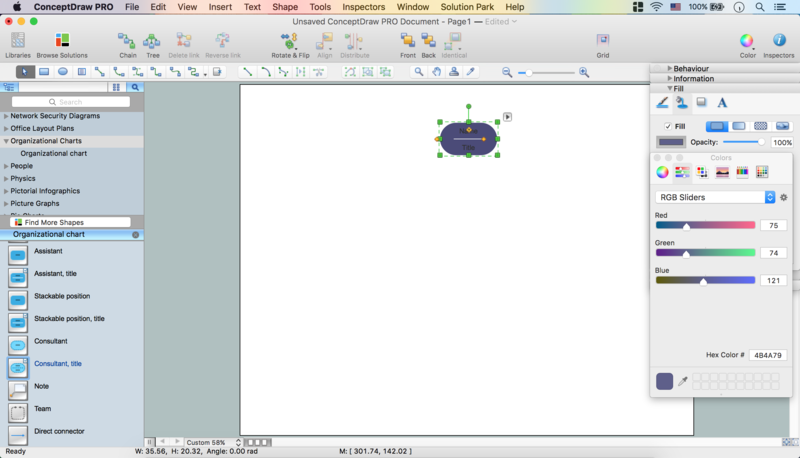 Change the object size using the Control dots. Line tab – Deselect Stroke. 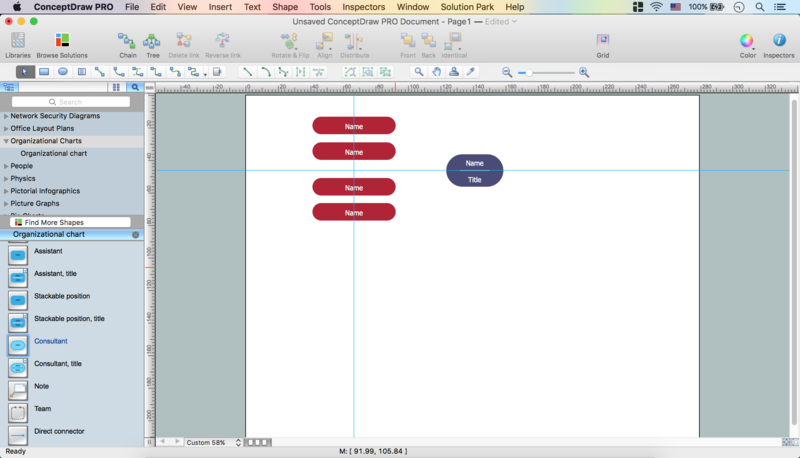 Fill tab – Change color, set Opacity. 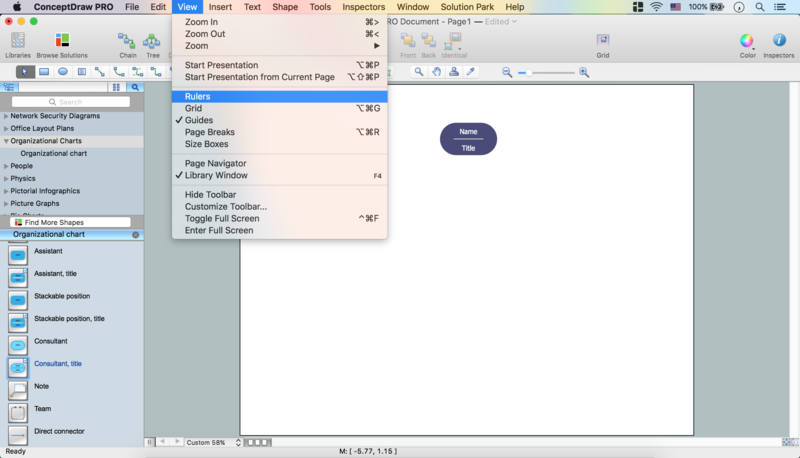 Text tab – Change color, set font, font size. Holding down the Option key (ALT), copy the object. Place it on the Guide. 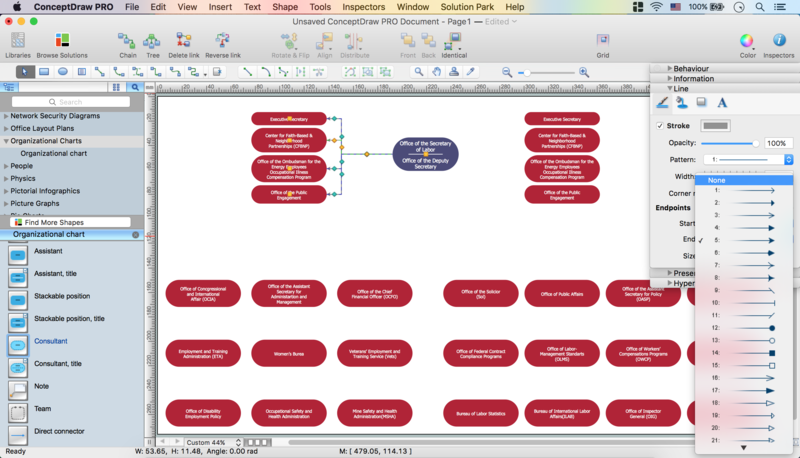 Select all the Consultant objects – Distribute option from the Toolbar – Middle. 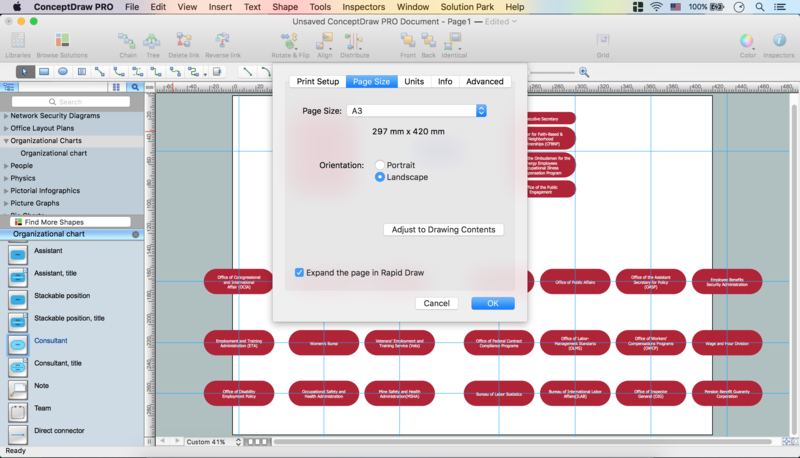 Go to the File Menu – Document Properties – Page size – A3. 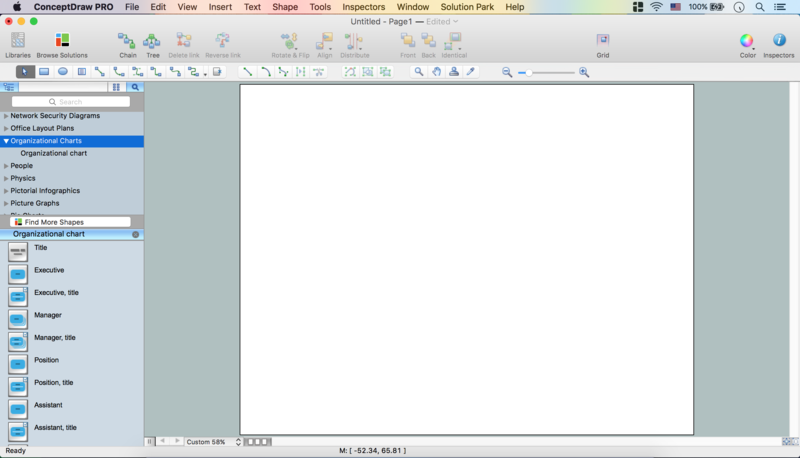 Holding down the Option key (ALT), copy the object. Place it on page. Add the text. 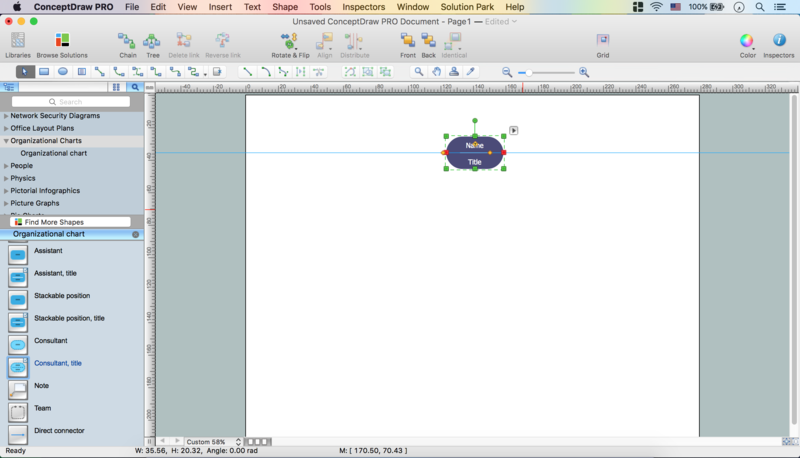 Arrange the objects using Guides. 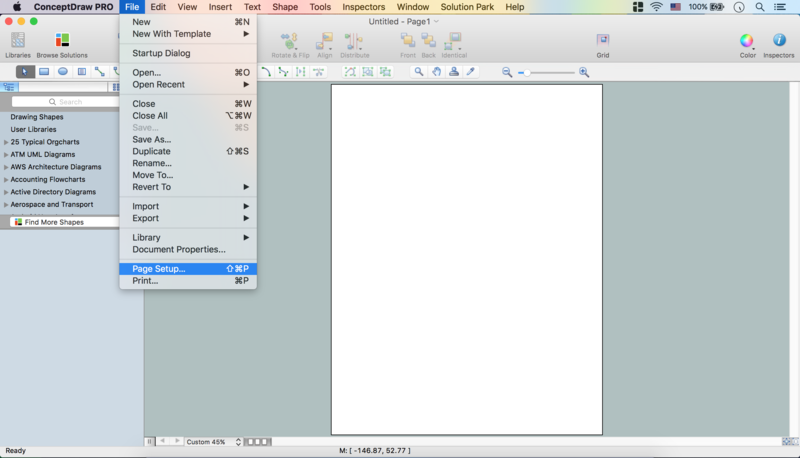 File – Document Properties – Page size – Adjust to drawing content – Ok. 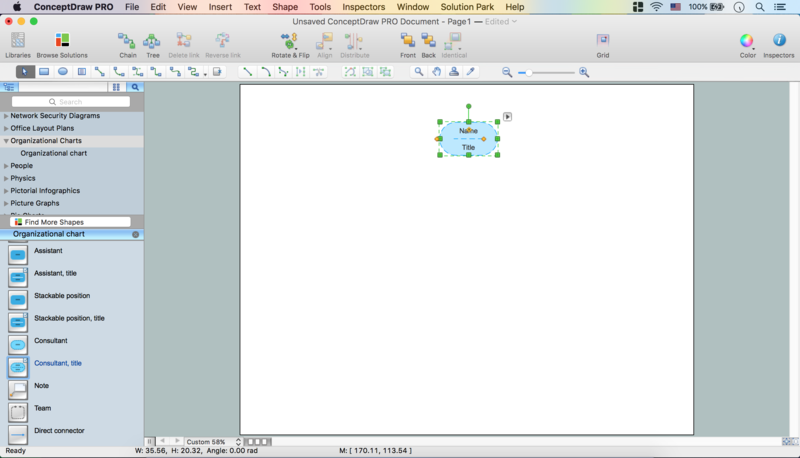 Distribute option – Arrange the distance between the objects. 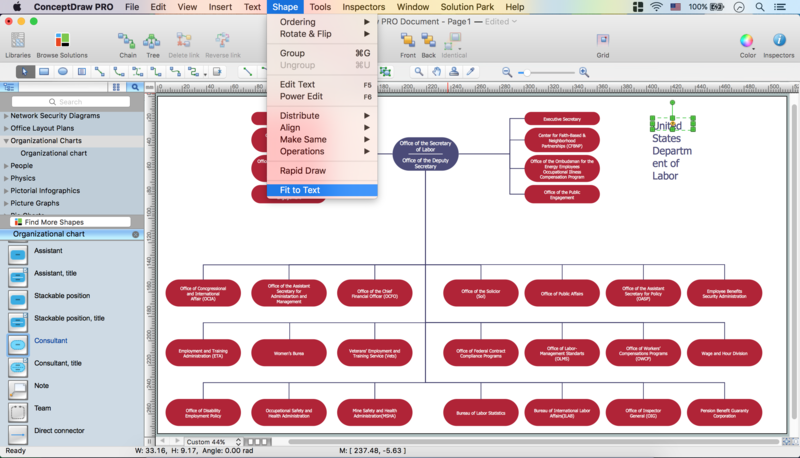 Select the objects (the main object will be selected with green color) – use Tree Mode from the Toolbar or Tools Menu – Tree Connection Mode. 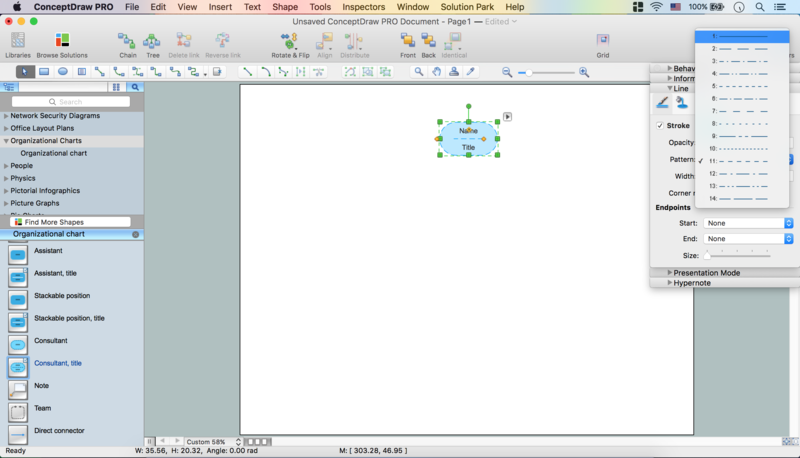 The objects will be connected with a direct connector by default. Select Smart Connector as a kind of connection. Select all connectors –open Inspectors – Line tab – Set Endpoints. Make color same as of the main object using Eyedropper. Connect all the object rows the same way. Drag a yellow diamond of the connector to arrange it. 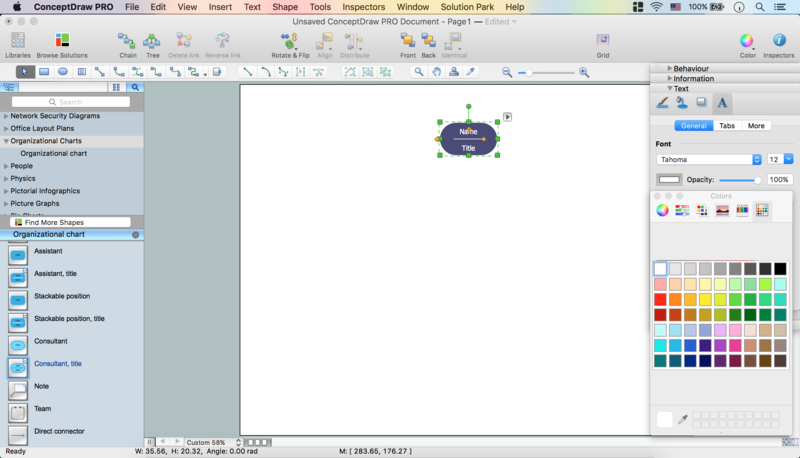 Double click on the white space of the page – enter diagram name. 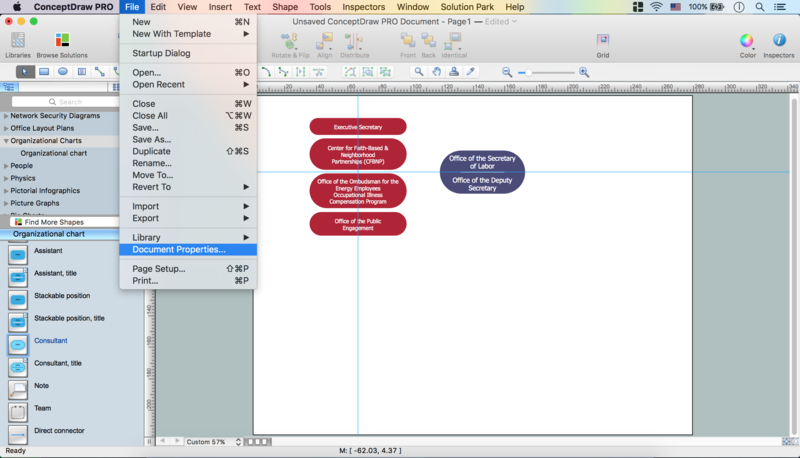 To edit the text, select it and open the Text tab from Inspectors. 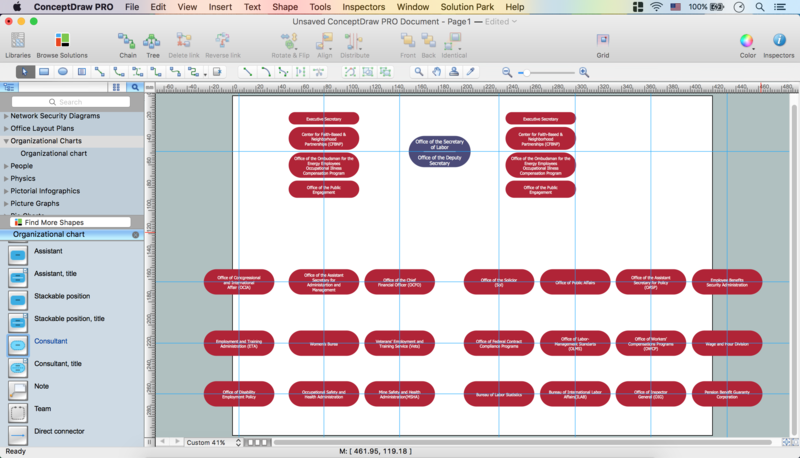 Set Font, Font size, Color. 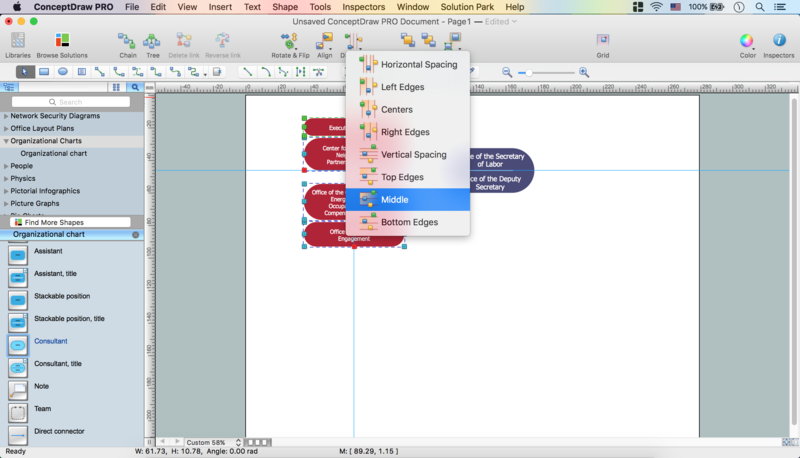 Shape – Fit to Text. 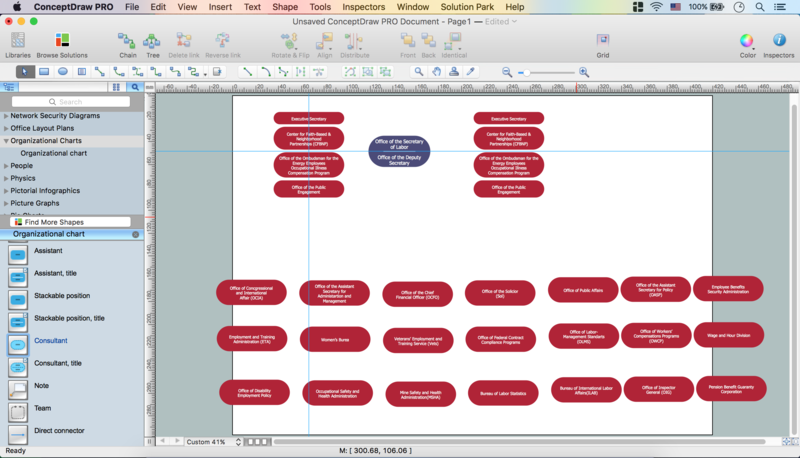 Automate Organizational chart creation. Import data from particularly any source. 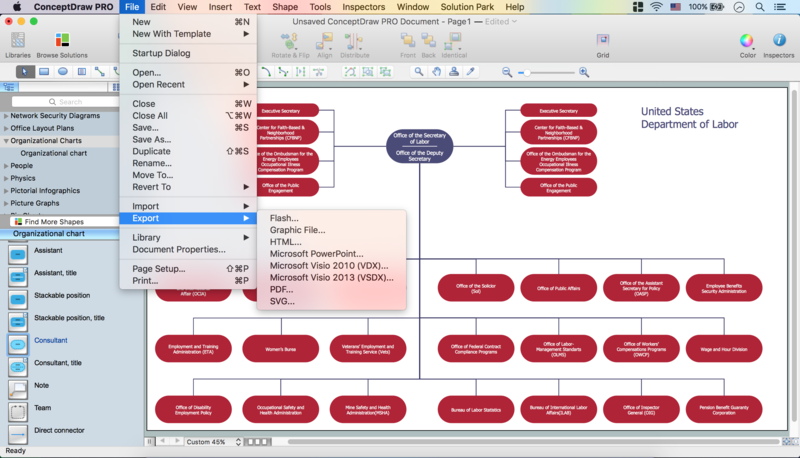 Extensive Export/Import possibilities (HTML, PDF, Flash, PowerPoint, MS Visio, etc). 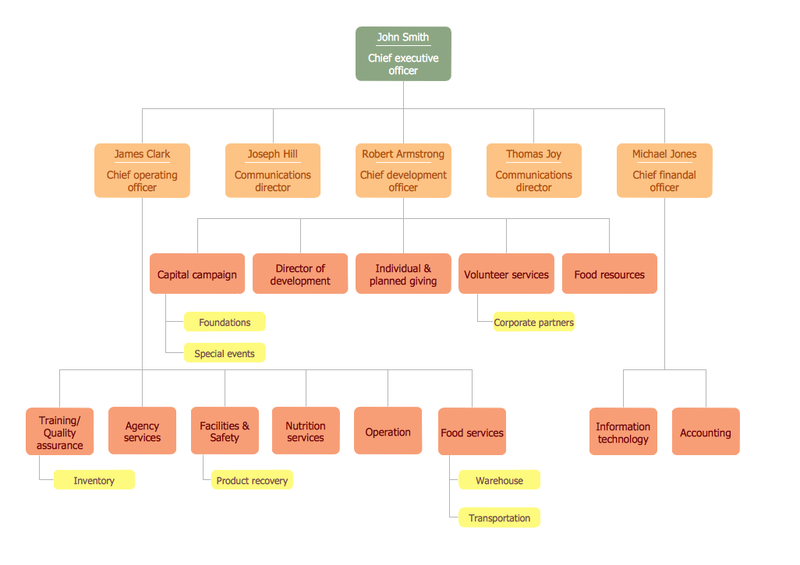 Use ConceptDraw DIAGRAM to oreate Organizational Chart. 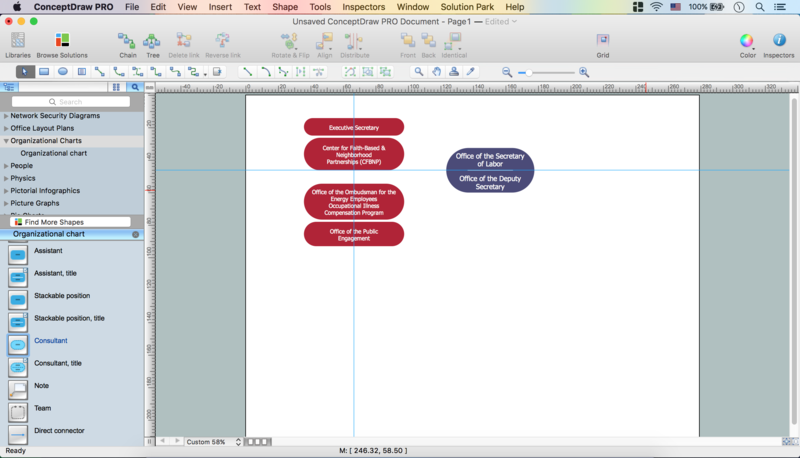 No other Organizational chart software gives you all these benefits at such reasonable price!